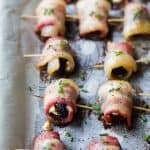 Bacon Wrapped Figs stuffed with an herb goat cheese – sweet salty deliciousness that will be gone in seconds! These easy wrapped figs will make the perfect holiday appetizer – plus bacon. YUM! Fill a medium sauce pan with water. Bring to a boil. Add dry figs to saucepan. Remove from heat and let figs sit for 5-10 minutes. Until they are plump. Remove figs from water and place on a paper towel lined plate. Pat dry. In a small bowl, add goat cheese, rosemary, thyme, sage and garlic powder. Using a fork mix everything together. Snip the stems of the figs and cut a slit in the figs (enough to stuff it with cheese) about a 1/2″. Stuff each fig with the goat cheese mixture then wrap with pre-sliced bacon and secure with a toothpick in them. Place wrapped figs on parchment paper lined baking sheet seam side down. Repeat process until on figs are stuffed and wrapped. Bake for 15-20 minutes or until bacon is crispy.